1897 March 11 : Born at Yamaga-Machi, Shikamoto-Gun, Kumamoto Prefecture. 1925 March : Got acquainted with Chise WAKATSUKI and Kakutaro KUBO. Late July : Comprehended a part of the Bodhisattva’ s doctrine. August 1 : Completed the writings of The Buddha’s Compassion and Destiny. 1926 July 31 :　Owari (his wife) received a divine revelation related to his missionary work. the doctrine at Hachimanin Temple in Watari, Fukushima. Destiny and The Lotus Sutra of Showa Era (1st Edition). September 18 : Under the name of Reiyuhkai, published The Lotus Sutra of the Showa Era and Johfukyo Bodhi-sattva and The Lotus Sutra of Showa Era (2nd Edition). Autumn : Completed the writings: Christianity and the Lotus Sutra of the Showa Era (3rd Edition). and The Lotus Sutra of the Showa Era (4th Edition) as a part of his work for the Myokokoku Construction. December 18: Published Sanpoh Sutra in mimeograph machine printing. 1930 January 18 : Under the name of Fumyodo, published Myohohdo Journal. March 3 : Published Kohraiten Sutra at Wase-Machi, Fukushima Prefecture. June : Went into an ascetic devotion in Aso, Kyushu. 1932 : Moved to a flat at Jinba-cho, Fukushima-City. July 7 : Constructed and opened the Makugawa Konjin Waterfall. 1933 : Moved the seminary hall to Wase-cho, Fukushsima-City. 1945 April : Changed the name of Myohoh-kai to Jisyudan. August 8 : Owari ( his wife) died at Yamaga-Town. 1949 November 3: Published Fount of all thoughts：The Root of the World Religions. 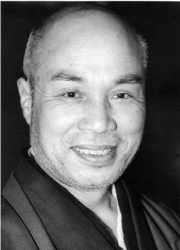 November 23 : Toshiro KASHIMA submitted to BEKK’s teachings. 1951 March 3 : Made a street sermon at Hyotan Pond in Asakusa in the guise of the dead. 1962 January 31: Entrusted Fumyokai to set up “Fumyodoh Seiseikaku” at the foot of Mt. restore their original divinity to revive as deities. April 3 : Published Gunjohrei Sutra, thus completing most of his teachings. 1965 July 8 : Died at Takamori-Cho, Kumamoto Prefecture.